Oone of the most sough-after titles from the acclaimed Three Blind Mice catalog. 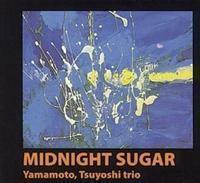 The Yamamoto Trio's Midnight Sugar was recorded March 1, 1974 at Aoi Studio, Tokyo. It earned the Best Engineering Award and Jazz Disc Award of Swing Journal in 1974. It is Yamamoto’s unmistakable skill and his jazz feeling which adds that certain touch of liveliness and spontaneity and makes Midnight Sugar a unique experience. This Piano Trio will mesmerize you with this great collection of standards, superb musicianship and awesome sonics. You are sure to listen to this one over and over. Few, if any, international audiophile jazz recordings have maintained the kind of deep and profound influence over techniques and even entire label repertoire as Three Blind Mice’s . The of-the-moment realism of Yoshihiko Kannari’s recordings and production aesthetic of producer and label head Takeshi “Tee” Fujii have been the benchmark to match. It is to their immense credit that “Blow Up,” “Midnight Sugar,” and “Misty” have yet to be matched, even 40 years later. Impex, who as Cisco Music has had a long association with Tee and Three Blind Mice, has finally made available these seminal recordings for this first time ever. Kevin Gray’s careful, unobtrusive mastering provides a near-analog like listening experience while you explore the deluxe book packaging with original photographs from the TBM archives and a new set of essays from NPR’s “Rhythm Planet” host Tom Schnabel. Impex has given their all to the Three Blind Mice Giving less for productions with these legacies would be a legendary mistake. Originally recorded in Tokyo in 1974, this Piano Trio release from TBM features Tsuyoshi Yamamoto on piano, Isoo Fukui on bass and Tetsujiro Obara on drums. This is Yamamoto's second TBM release, after his debut TBM release entitled: Midnight Sugar. Seven songs are on this record including: Misty, Honey Suckle Rose and Angel Eyes. Yamamoto is highly musical and his expressions natural, neither overly technical nor serious, his performance is relaxed and melodious. Touring with the Micky Curtis Band, Yamamoto had the chance to explore several international experiences that he would later use on this album as he worked with this band in France, England and Switzerland. On “Midnight Sugar,” the Tsuyoshi Yamamoto Trio plays two of Tsuyoshi’s own blues improvisations followed by jazz ballads that became standards for the Trio. The combination of these titles is nothing but exceptional. It is Yamamoto’s unmistakable skill and his jazz feeling which adds that certain touch of liveliness and spontaneity and makes Midnight Sugar a unique experience.